Did you know that with our GotoWebinar Integration that you can also get calendar links that you can embed into your Infusionsoft emails? This is a great way to boost your attendance to your webinar. People like having these convenient calendar links so they can simply click the link and have the webinar date and time show up on their personal calendar. First off, when setting up the GotoWebinar Integration Helper, you need to save the Webinar Calendar Link to an Infusionsoft custom field. If you don't save the link to a custom field, you won't have any way of merging in the link later. And, in fact, the toolbar button to copy the calendar links will be disabled. To do this, look in the section at the top called Save Reminder Information and then look for the dropdown on the bottom right named Webinar Calendar Link to Infusionsoft. 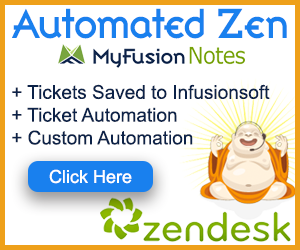 Select the dropdown and assign the value to an Infusionsoft custom field. Next, complete the webinar helper setup selecting your desired options. Now, you'll be brought back out to the list of Helpers you've created and the GotoWebinar Helper you just saved will be at the top of the list. Look at the toolbar icons for this Helper and you'll see one that looks like a calendar. iCal – Use this link to allow registrants to save the calendar appointment to their Apple calendar. Google – Use this link to allow registrants to save the calendar appointment to their Google calendar. Outlook – Use this link to allow registrants to save the calendar appointment to their Outlook calendar. Now simply copy those links and paste them in to your webinar confirmation emails. PRO TIP: To make your emails look really nice, don't just paste in the links, but use three icons for the iCal, Google and Outlook calendar links and add the link to the image so that when they click on the calendar image it adds to their selected calendar.